Eagleburgmann Saudi Arabia, a market leader with over 130 years of global experience in supplying various products such as mechanical seals, seal supply system, packings and gaskets, magnetic couplings, carbon floating rings, expansion joints and special seals, plans to expand its capability in the kingdom. 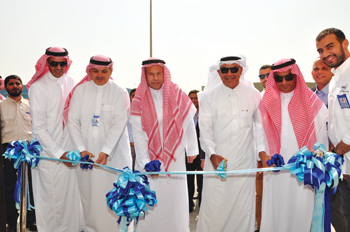 As part of the company’s continued investment programme, EagleBurgmann Saudi Arabia has built a new state-of-the-art service facility in Jubail, Saudi Arabia to cater to its increasing mechanical seal population in this region. The new facility was inaugurated by Dr Andreas Raps, CEO EagleBurgmann Germany GmbH & Co KG and the company’s local JV partner Abdulrahman K Al Dabal, president and CEO, Gas Arabian Services. This expansion will provide increased service capacity, capability as well as additional technical support. Biju Chacko, senior sales director, explains: "This Jubail expansion will include new offices and servicing capabilities, all of which will enhance our support to the end-user in Jubail region and pursue our strategy for regional growth." "Also, since our growth plans align closely with Saudi Arabia’s ‘Vision 2030’ plan for the kingdom and IKTVA initiative by Saudi Aramco, we see huge prospects ahead. EagleBurgmann’s products are supported by after-sales and service, often backed up by long-term service agreements. The company constantly innovates and introduces new products to the market. Recently we introduced important technologies such as Diamond Faces, CoBa Seals and Rotech Boosters for compressor applications and have many success stories in the country," says Chacko. "We regularly train our customers in the various aspects of mechanical seals so that they best utilise their equipment. The training involves the best practices adopted in the industry and, in addition to in-kingdom programmes, training sessions are often held in Germany and Japan, all of which adhere to the highest quality and HSE standards," he says. "We have a regional office based in Jebel Ali, Dubai, which supports sales and service activities in all GCC countries. Globally, EagleBurgmann has over 60 subsidiaries, 131 service centres, 162 sales offices, 45,000 customers and over 5,800 employees," he adds.